Traditional Chinese Medicine or TCM is based, among other things, on the five Chinese elements of wood, fire earth, metal and water. The tradition believes that these elements depict dynamic states of moving energy and phases of change. Each of these elements represents the energies of the cycle of life in our seasons, stages of life, personalities and organs in our system. To understand the relationship between the elements and seasons or stages of life, we need to know the characteristics of each of the five elements. The element of wood is one of rising, development of an action, impulse, and expansion. While fire is an embodiment, definition, action, dynamic phase, and design. Earth is an alteration, transformation, transmutation, or change. Metal is an energy of sinking, contraction, declining and water is contemplation, calmness, observation, and reflection. Each of these elements relates to each other and has a productive and destructive cycle. 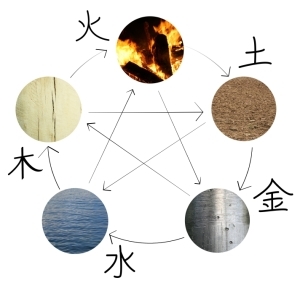 Referring to the picture in the picture above, the productive cycle states that wood supplies fire, fire produces earth, earth bears metal, metal gathers water, and water nurtures wood. Conversely, the destructive cycle says wood divides earth, earth soaks up water, water puts out fire, fire liquefies metal, and metal cuts wood. Each season is represented by a particular element. Wood is the element of spring where plants sprout from the ground and there is the potential of life evident everywhere we look. It is associated with youth and growth and is depicted by the color green. Fire represents summer with its full heat and warmth and has the most overt energy of the phases. Fire has the color of red. In late summer, the crops are in full bloom, the sun is still high in the sky, providing warmth and energy, yet without the high heat of summer. This period is ruled by the element of earth and is a time of harmony and mellowness. Its color is yellow. As autumn beings, crops are harvested and stored for the winter. There is a contraction as metal directs the energy of this season. Its color represents purity or white. Water is the elemental energy associated with winter, when a state of extreme yin prevails. Winter is the season of stillness and rest, during which energy is condensed, conserved, and stored. Water is a highly concentrated element containing great potential power awaiting release. Its color is either blue or black. These five elements having specific energy relate to different stages of life. Wood has the energy of the beginning of life. Our first years are consumed with our growth and development. This time span involves our first 20 years of life. Fire represents our passionate years, those filled with yearning, striving, and excessive energy to achieve our dreams. The years involved are 20’s – 40’s. Earth represents our harmonious years or our middle years filled with growing our families, perfecting our careers, pursuing our hearts desires, while maintaining a sense of balance. There is an overriding settling energy. The year span is the longest from approximately early 40’s to late-60’s. Metal depicts our aging years where we pare down our possessions and perhaps our friends and families. We limit our movements and our energy becomes diminished. The year span is our late 60’s and beyond. Water is our return to the earth. It is the end of life and our awaiting rebirth. We are born under the aspects of particular elements influencing our personalities. Those born with the wood element are generous, confident, moral, love to explore, have strong powers of persuasion, and are very diligent in their work. They are often artists in whatever field they choose. They keep themselves busy as they believe in hard work, often as part of a team. They are loyal friends and are very compassionate. They have varied interests and may take on more than they can handle. People of the wood element are not selfish, tend to be spendthrifts, and have a deep appreciation of what they have and do not lust after that which they cannot attain. One thing they need to work on is learning their own limits and not to become overly dependent upon others. Those born with the fire element have dynamic personalities, love adventure & excitement, love being with other people, are confident, competitive, restless and may become great leaders. They tend to be charismatic, decisive, dramatic, brilliant and warm. They like to explore anything new and may be aggressive about achieving the things they want in life. Those born with the fire element are clever and are gifted speakers. They can be hypersensitive and may become selfish and inconsiderate. They become impatient when they are thwarted in their ambitions. When they try to force their way, they hit more obstacles. It is best if they can learn patience and compassion. The Earth element personality is one of a high sense of duty, logic, ambition, idealism, patience and reliability. These individuals have a strong discipline, an ethical nature, follow their intuition and have strong deductive talents. Earth people use their resources wisely and are good planners & administrators. They are wise in all financial issues. They are usually respected and admired. They want to be important as well as loved. They may be considered to be stubborn, rigid or controlling. They have a fear of the unknown. It would do them well to let go of control and to become a bit more adventurous in life. Metal element individuals are tenacious, self-reliant, reserved, orderly, confidant, determined, virtuous, and natural problem solvers. They are a bit impulsive, like to enjoy themselves and are rather set in their ways. They know what they want and pursue it to success. They are forceful and unyielding and they can be unreasonable and stubborn sometimes. They are demanding when in charge and expect all around them to meet their high expectations. The water element lends a flexible and ‘go with the flow’ aspect to this personality. These people are intelligent, creative, compassionate, charming and sensitive. They may have more than one profession, are great communicators, diplomatic, intuitive, organized, and have great imaginations. People born with the water element may also be secretive, deceptive and manipulative. Water tends to try to find the easiest way out and may be malleable to the whims of others. They need to learn to stand on their own two feet and follow their own path. The elements also rule our organs with each element specific to the energies of certain elements. Wood is associated with the liver and gall bladder. The function of the liver is strategic planning and architecting our vision of the future. The gall bladder enables us to make decisions and judge wisely. Blocking the wood energy gives rise to feelings of frustration, anger, and stagnation. The fire element is related to the heart, heart protector or pericardium, temperature regulation and the small intestine. The heart is the seat of human emotions and the organ whose constant warmth and pulse keeps blood and energy moving. The small intestine separates the pure and impure. If the fire energy is blocked it results in hypertension and hysteria, heart problems, insomnia and anxiety. The earth element in the body is associated with the stomach, spleen, and pancreas, which lie at the center of the body and nourish the entire system. If earth energy is deficient, digestion is impaired and the entire organism is thrown off balance owing to vitality and insufficient nourishment. Metal energy controls the lungs and large intestine. Each of these organs takes in nourishment in the form of air or food and expels the resulting waste. This energy urges us to let go, experience grief and welcome in the new. If this energy is imbalanced it can result in breathing difficulties, chest pain, skin problems and a weak immune system. In the human body, water is associated with the kidneys and bladder that regulate the water that resides in our blood, lymph and cells. These organs eliminate excess and set aside the pure to be reused by our bodies. When in balance, the gift of the water element is purity and strength and when out of balance, it is the emotion of fear. Understanding the characteristics of the Chinese elements and how that affect our lives, cycles and bodies is important to understanding our world and ourselves.